Preheat oven to 180°C/350°F. Add flour, ground almonds, cane sugar, cocoa powder, baking powder, baking soda, half oft he salt, apple cider vinegar, vegetable oil, almond milk, and sparkling water to a large bowl. Halve and pit half the avocados and mash the flesh with a fork. Add to the bowl and beat with the hand mixer until a smooth batter forms. Grease the springform pan and dust with flour. Transfer batter into the pan and bake at 180°C/350°F for approx. 45 min. or until a toothpick inserted into the center of the cake comes out clean. Remove from the oven and let cool. Meanwhile, peel, pit, and mash remaining avocado and add to a bowl. Add lemon juice, vanilla extract, remaining salt, and confectioner’s sugar and stir to combine. Refrigerate while the cake is cooling. 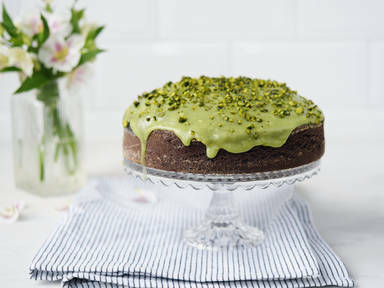 Spread frosting evenly on the cooled cake and sprinkle with chopped pistachios. Enjoy!